Looking for a clever way to treat guests? Spice up your ice cubes with fresh berries! Pocket Change Gourmet shows us how to make quick and refreshing berry ice cubes to accompany her Berry Punch recipe. These berry ice cubes are ideal for adding vitamins and antioxidants to any drink. Best of all, these ice cubes are a quick and easy trick for boosting your metabolism and flushing toxins out of the body! 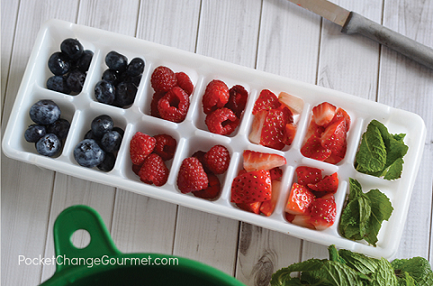 Place berries into ice cube trays.